Scientists have studied Pluto’s icy heart and now have several theories to explain how the planet’s frozen heart-shaped region was formed. The Sputnik Planitia, Pluto’s cold heart western lobe, is believed to be created by the impact of an object from the Kuiper Belt or by the same planet when it was still quickly spinning and trying to coordinate with one of its moons, Charon. Pluto’s icy heart contains frozen nitrogen, methane, and carbon monoxide and was first spotted by NASA’s New Horizons spacecraft in 2015. The frozen region appears opposite to Charon, which supports scientists’ theory that does not involve an impact. A study made by University of Maryland astronomy professor Douglas Hamilton and New Horizons colleagues shows that the heart-shaped heart cap made of nitrogen could have been formed many years before when Pluto was spinning faster than it does today. Hamilton used computer models and found that the initial location of the frozen area could have been formed by Pluto’s complex climate. Models showed that the planet’s temperatures changed according to Pluto’s tilt. The computer models used in Hamilton’s study also showed that ice attracts more ice. When temperatures remain low, more ice is drawn to the area, and the cycle repeats. The phenomenon is called the albedo effect and presents a theory that could explain the ice cap on Pluto’s heart. Regarding the heart-shaped region’s basin formation, Hamilton’s theory says that the ice cap could have been heavy enough to sink the area a few miles into the planet’s crust. The weight of the ice cap would also explain why Sputnik Planitia is lower than its surroundings. Hamilton’s research was published in the journal Nature December 1 along with other studies that also try to explain Pluto’s icy heart. Compared to Hamilton’s theories, the other papers suspect there is a subsurface ocean on Pluto. Francis Nimmo of the University of California Santa Cruz alongside New Horizons colleagues also used computer models but included the theory of the object that impacted the region to explain the heart-shaped area formation. Nimmo’s theory suggests that Sputnik Planitia basin was provoked by the impact of an object, similar to what happened to Pluto’s moon Charon. If Nimmo theory is correct, the impact created the basin and then moved to its present location due to Pluto’s high-speed rotation. “An impact will excavate ice at the surface, letting any water underneath it approach closer to the surface. Because water is denser than ice, it provides a source of extra mass to help drive Sputnik’s migration,” said Nimmo in his study. “Pluto’s ice-covered “heart” is clearly visible in this false-color image from NASA’s New Horizons spacecraft. The left, roughly oval lobe is the basin informally named Sputnik Planitia, which appears directly opposite Pluto’s largest moon, Charon, pictured at top left,” NASA said. Image credit: NASA/JHUAPL/SwRI. 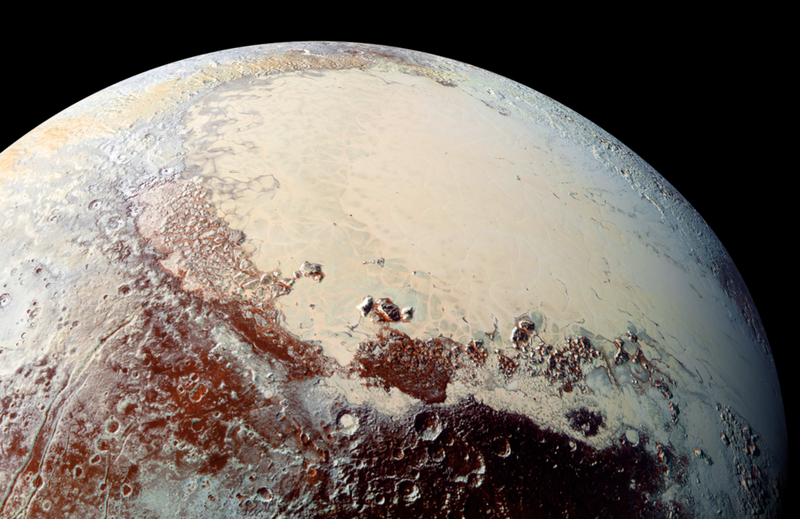 Nimmo argues that a frozen ocean could explain the planet’s network of fractures clearly seen on Pluto’s surface. He explained that a subsurface water body could survive for billions of years thanks to Pluto’s radioactive decay in its interior. 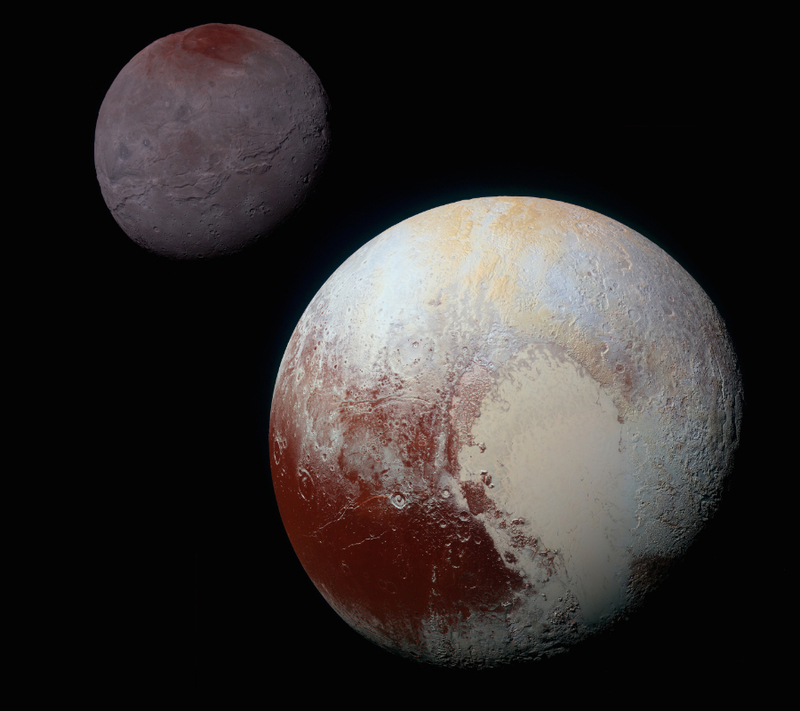 Pluto’s studies are highly valuable since its subsurface ocean and its icy regions are a sign that suggests other dwarf planets in deep space may contain oceans. Frozen or not, space water bodies could host life, although it might be different than the one we are used to see on Earth.